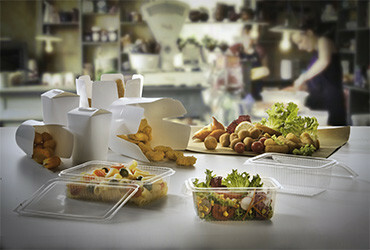 Replacing traditional plastics with bio-plastics in many industrial catering areas makes the waste-management process remarkably easier and optimises separate collection. 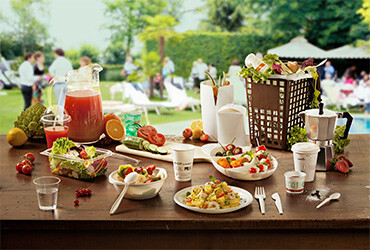 All products are food grade and are EN 13432-certified as ‘compostable’. 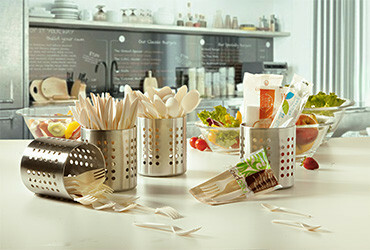 ​So, consumers can throw both the food and the biodegradable, compostable cutlery in the wet waste bin so they will be composted together, naturally turned by microorganisms into water, CO2 and biomass. The compost will fertilise the soil on which new plants will grow, which will in turn be converted into new materials. A virtuous cycle that starts and ends in nature and that, from start to end, uses up less non-renewable resources, less energy and emits less greenhouse gases.